Samsung is the no#1 mobile brand in the world as well as in Bangladesh also. Samsung is famous for its new innovation and design. Recently it introduces Infinity-O display on their developer’s conference 2018. And Samsung Galaxy S10e is one of the Infinity-O display mobile. At the launching event of Galaxy S10E Samsung also unveiled its most awaited two flagship smartphone one is Samsung Galaxy S10 and another is Samsung Galaxy S10 Plus. Samsung Galaxy S10e comes with 5.8 inches Dynamic AMOLED Infinity-O display. This flagship smartphone is powered by the latest Qualcomm Snapdragon 855 chipset, also its available on Exynos 9820 processor for some few Asian countries. The phone has two sizes RAM options one is 6 GB and another is 8 GB. So you can choose your perfect one based on your using capacity. This device also offers you 128 GB and 256 GB of native storage. Samsung Galaxy S10E runs on Android 9.0 pie, One UI on top. Galaxy S10E has 12MP primary sensor with 16MP telephoto rear sensor and 10MP selfie shooter. That camera sensor makes your perfect photos. With this feature, it also offers a side-mounted fingerprint sensor and latest Wi-Fi technology. Samsung Galaxy S10E is fully loaded with 3100mAh non-removable Li-Polymer battery backup. Its great feature is 15W wired fast charging. That makes your phone fully loaded within an hour. 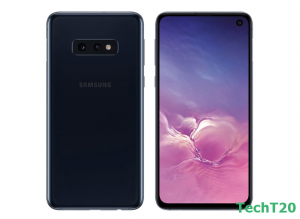 Samsung Galaxy S10E expected official price in Bangladesh BDT 74,900. Its global price is $749.99, so its price may vary in the Bangladesh market. ~ 5.8 inches Dynamic AMOLED Display. ~ Corning Gorilla Glass 6. ~ Android OS, v9.0 (Pie). ~ 2.8 GHz Octa-core Mongoose M4 Processor. ~ Dual 12 MP+16 MP Rear & 10 MP Front Camera. ~ 6/8 GB of RAM & 128 GB of internal storage.